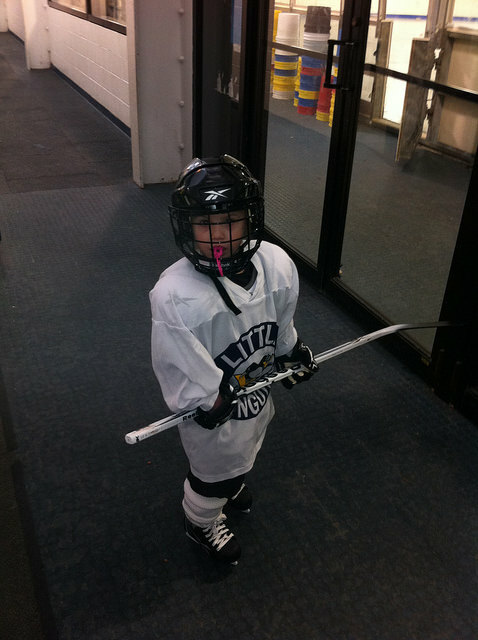 Dads-Deals.com » Dad's Corner » Our Daughter’s Experience In Youth Ice Hockey Last Season. So for those of you that are new to our blog, we are a hockey family. 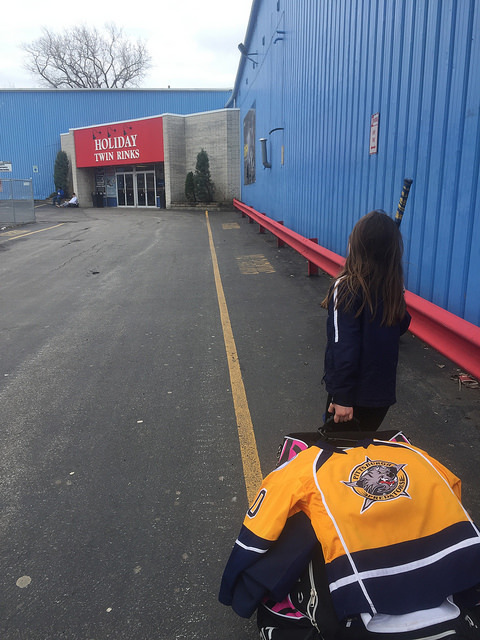 Our daughter has been playing ice hockey since she was 4 years old she is now almost 10 (you can read more here). 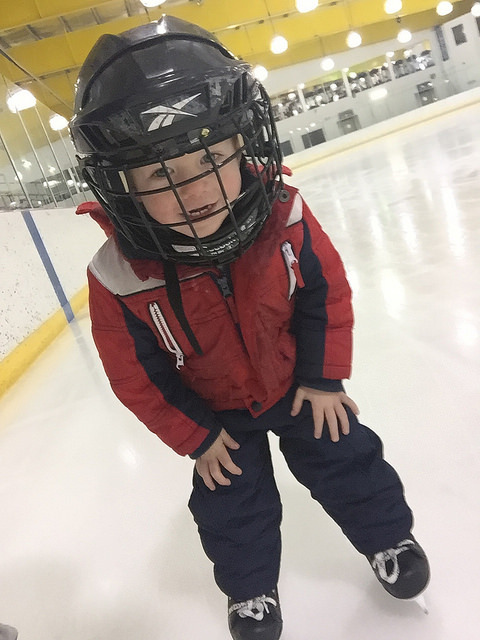 We also have 3 year old; he was on skates by the time he was 18 months old. He is crazy about hockey. He has pretty much grown up at the rink, so I am sure there will be posts about him playing hockey in the near future. He can start playing in learn to play ice hockey classes when he is 4 years old. Since it has been a few years from my last post about our daughter’s ice hockey experiences, here is an update of last season. She moved up to the Squirt level which is 8-10 years old. Her birthday falls late in the year so she was the youngest on her team last year and the only girl again. On the Squirt level they move away from cross ice 3 on 3 to full ice 5 on 5, just like pro hockey players. Tryouts were held in mid April and the season began August 1st, then ended April 1st with a tournament in Buffalo NY. Between August and April almost every Saturday and Sunday we are up by 5 am for 7 am practices. There is usually a practice during the week after school as well. Aside from the practices there were 6 practice games in September and by October they start placement games and there are 6 of those. Once the placement game are done, the league breaks the teams down into divisions consisting of 8-10 teams based on skill level. After the divisions are set, (which takes about a week) the regular season starts. The regular season is 16 games, about one a week for a little longer than 4 months with holidays breaks and what not (November-March). 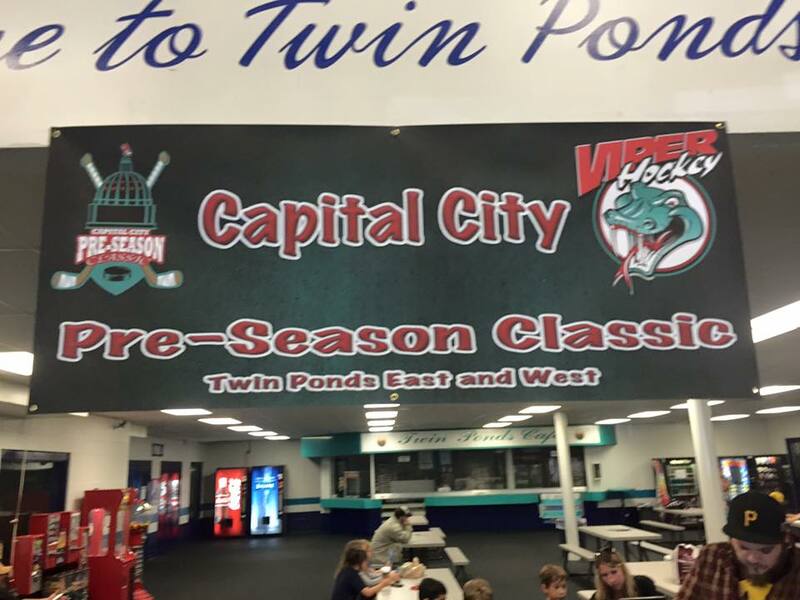 They also do about 3 or 4 youth ice hockey tournaments during the season which are a ton of fun. 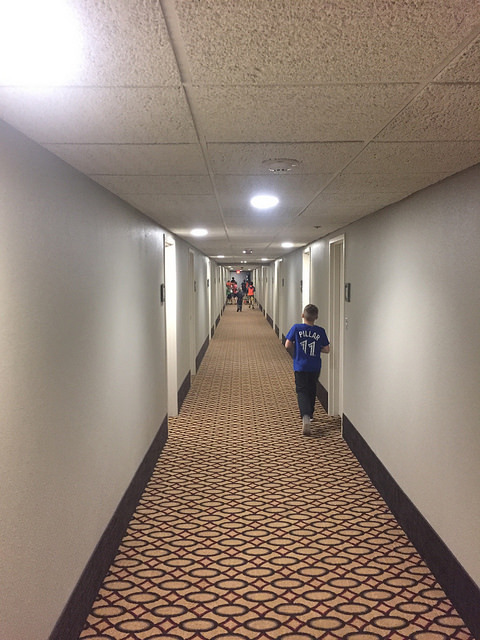 Last season before the games got started we traveled 3 ½ hours to Harrisburg PA for a preseason tournament. It was a great experience for all of the children and it really brought them together as a team. It seemed really helpful for our daughter because it let the boys on the team see that she is just like them and can do anything they can. They didn’t win a single game, but they all had fun. When they weren’t playing hockey, they were swimming and chasing each other all over the hotel. There was a great deal of pizza consumed while we were there. 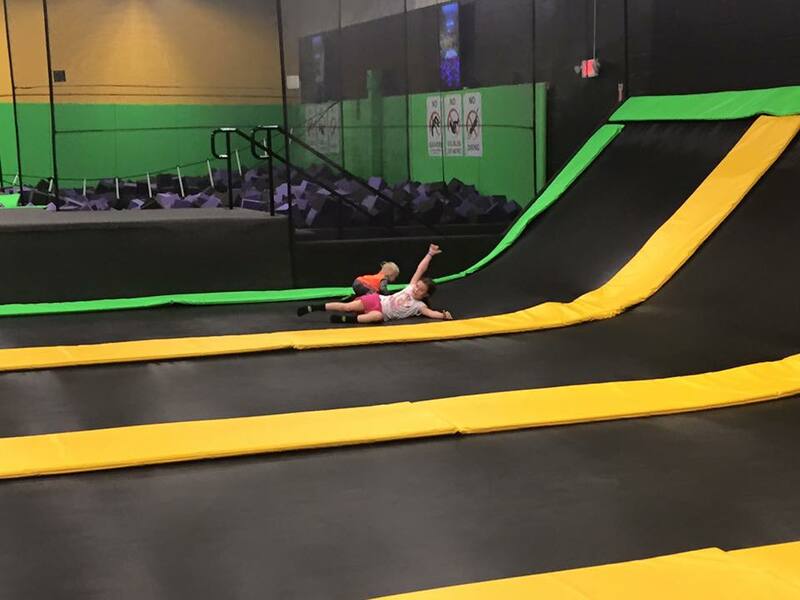 One of the days we were there they didn’t have a crazy early hockey game the next morning so at night about half of the team went to a trampoline park for a few hours. 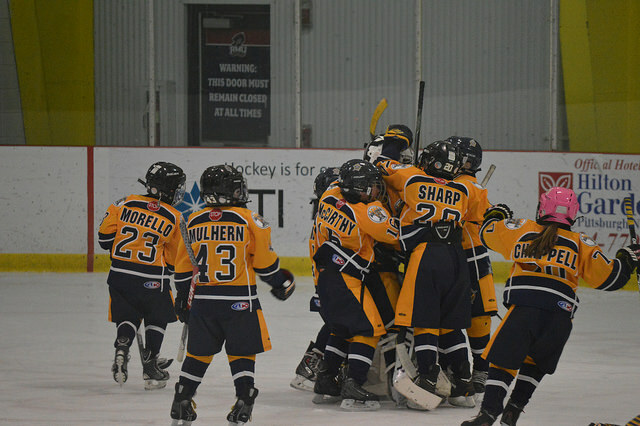 During the season it was fun watching all of the children grow as hockey players. Some (like our daughter) had a lot to learn going from a mite to a squirt. 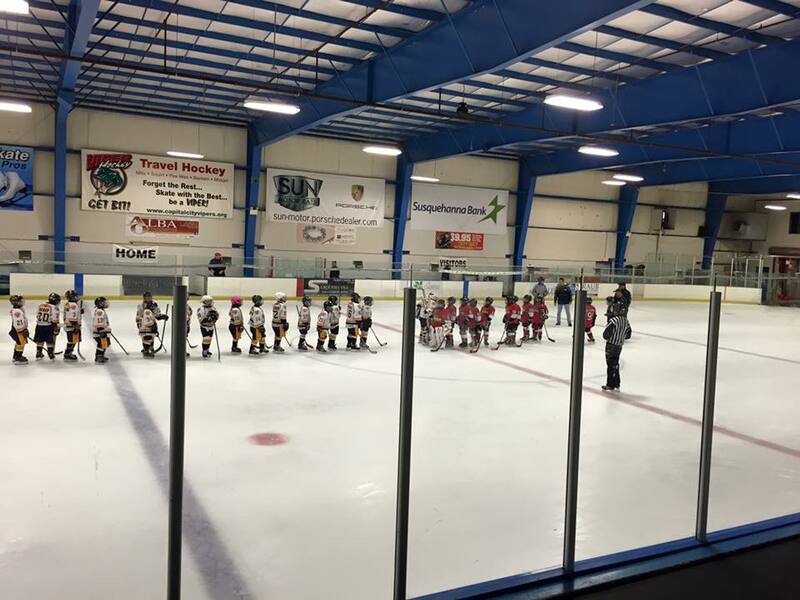 At the mites level there really aren’t a whole lot of penalties called and they don’t do offsides, positions (wings, center, defense) and the only time there is a faceoff for mites is the start of the game (unless it is a tournament). 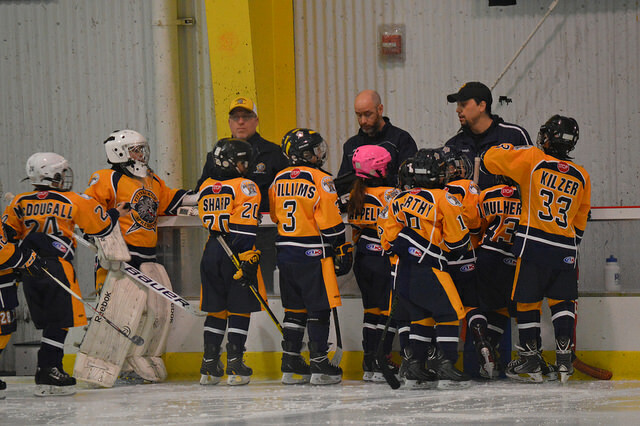 Squirts also play 3 periods of 12 minute each and stop the clock when play stops. Throughout the regular season, they all grew as a team and it showed on and off of the ice. The team went 4 wins, 10 losses, and 2 ties. Even the losses were generally close games. The games were so fun to watch and most parents really get in to the games, some maybe even a little to much, that is worth a completely separate post in itself. Her team also was invited to play a team from Cincinnati, OH. 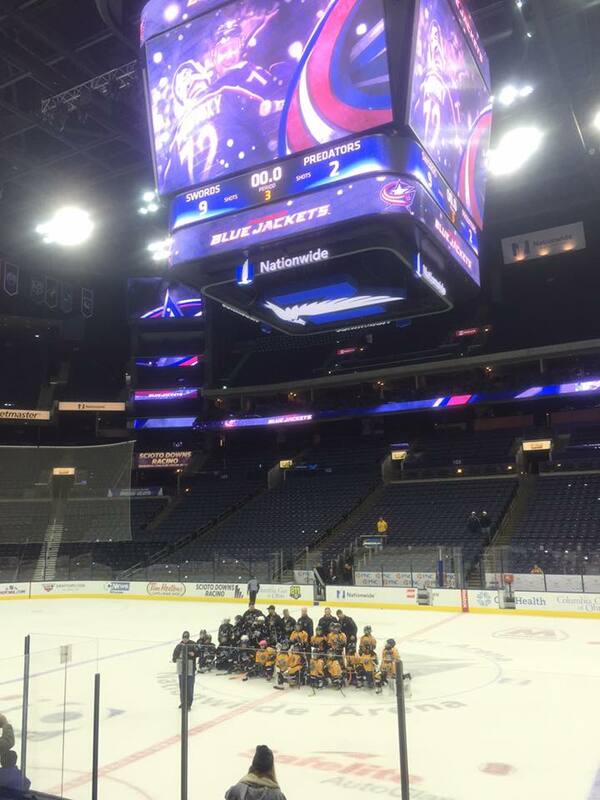 we played a game against them here in Pittsburgh then a month later we went to Columbus, OH and played against them on the Columbus Blue Jackets ice rink, which was so amazing. Allie took her first penalty as a squirt. With less than 30 seconds on the clock, she got called for tripping. 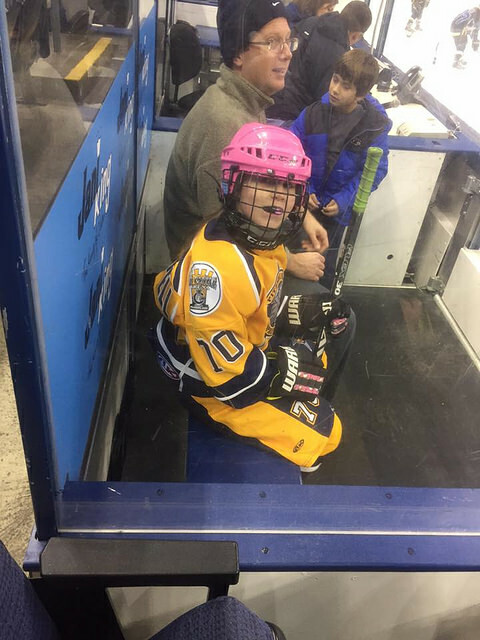 I told her “Hey, if you are going to get a penalty, what better time than when you have a chance to sit in an actual NHL penalty box?” This whole 2 day trip turned into an adventure in the youth ice hockey world that I am currently working on a post for. Outside of the mayhem we went through to get there, it was still a ton of fun. 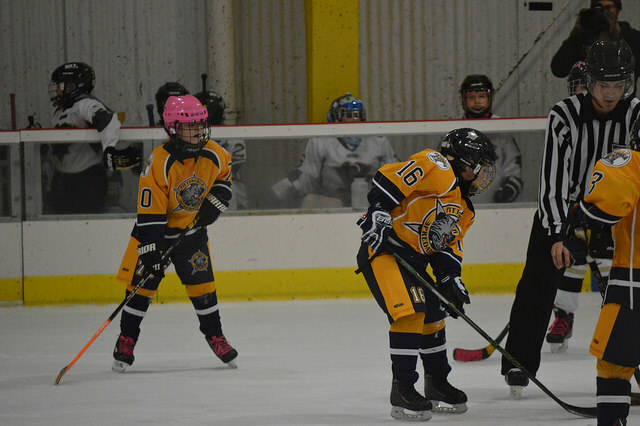 The weekend after Christmas there is a youth ice hockey tournament here in Pittsburgh. The way these tournaments work is, each period is worth one point and if it is tied the point is split. The team with the highest score at the end of the game gets 2 additional points for a total of 5 possible points. During the tournament, the team led every period but one and they tied that one. One of the periods, our daughter got the only goal with only a little time left and the team got the point for that period. With that goal, they sealed the deal for the appearance in the championship game. She got the game puck for that game! So, then her team was in the championship game, which was her first time in a championship game. The whole team played so amazing the whole tournament, but this game they played even better than they had been. They ended up shutting the team out 4-0 and won the championship! It was so awesome to watch, there were some gloves, and maybe a stick or two, that went flying in celebration. They took turns skating around with the trophy as We Are The Champions played over the sound system. They all received little championship trophies as well. In the weeks that followed, every kid got to take the trophy home with them for about a week. When it was our daughters turn she wanted to make a huge cream soda float and, of course, our son had to jump in and drink some. 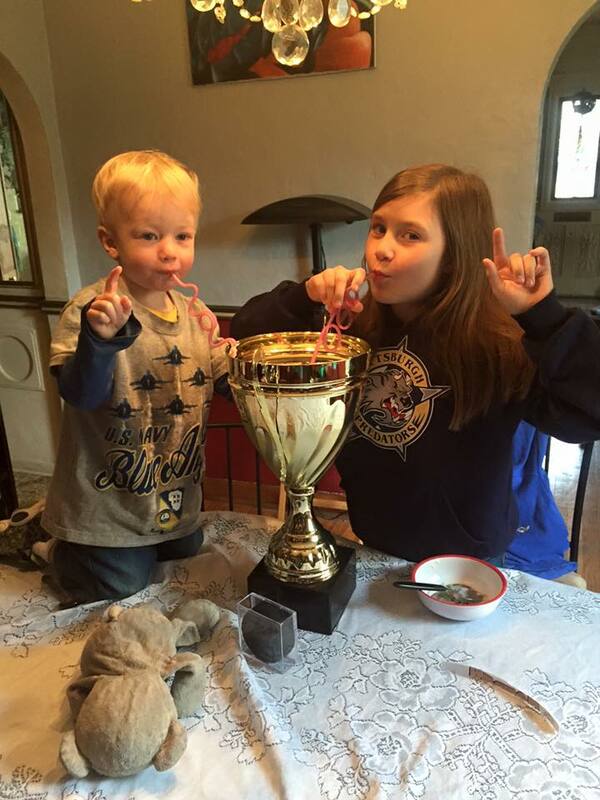 He kept yelling “We number 1!” In front of the trophy is her game puck that she got from the one game. She was so happy that she got the game puck. We even got a puck case for it so she could have some way to display it and keep it safe. At the end of the season, every team takes part in the playoffs. They are placed based on how well they did during the regular season. Unfortunately, her team lost every game, but again, the kids had fun in those games. 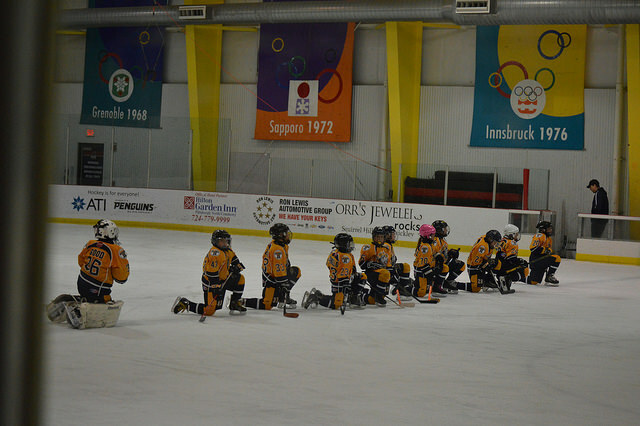 They were close to winning one of the games but….. remember how I said hockey parents can be crazy? Well, the one game we were ahead by a goal and with a little time left in the game, a player from the other team just entered in to their zone and a parent from the other team blew a whistle. Our daughter’s whole team heard the whistle and stopped playing, while the other team kept going and tied the game up. They then beat us in over time. 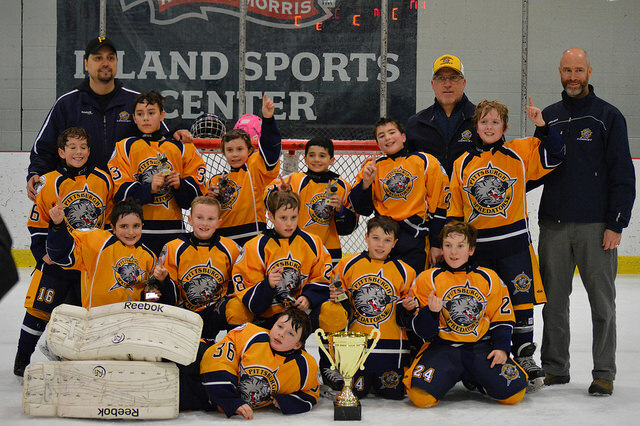 After the season was over, they had an end of the year tournament in Buffalo, NY for youth ice hockey teams from the U.S. and Canada. The tournament itself was terrible. The tournament organizers placed her team way too high, so they played against AA hockey teams and pretty much got crushed every game. But, the team had a blast outside of the hockey games. 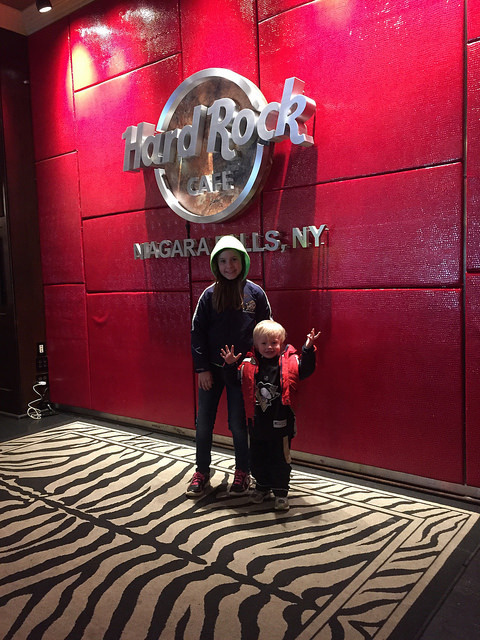 We, along with few of the other families, went to the Hard Rock Cafe in Niagara Falls, NY one day for lunch. After lunch, all of us went to the see the falls on the U.S. side and it started snowing really hard (like actually painful! ), so that didn’t last too long before we headed back to where we parked. It was still a pretty cool sight with the falls and snow falling, even if it was April. Before we left, the team manager went on amazon.com and bought the whole team nerf guns with over 200 rounds of ammo. It was insane. The team was running all over the hotel shooting each other. We were finding the nerf darts EVERYWHERE! The day we were leaving I found one in the ice machine. 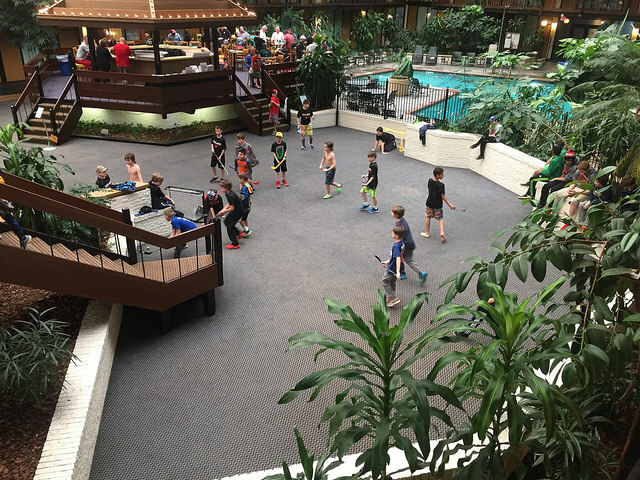 There were 3 other hockey teams staying in the hotel, so there were always mini stick hockey games going on in the courtyard almost all day until they would get kicked out at 10 pm. The little hockey balls only ended up in the pool and plants a few times (insert sarcasm). 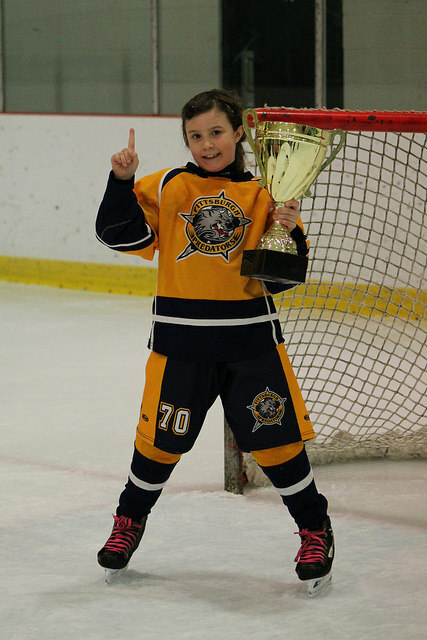 The end of that tournament concluded the hockey season for her team. She exchanged Xbox user names with a few of her teammates and now they connect on Xbox live and play Star Wars Battlefront or MineCraft pretty often. Now this year’s hockey season has gotten under way. I know we are looking forward to the adventure that the youth ice hockey season brings with it. To see more pictures check out our Flickr page. What sports or activities are your kids into? Do you have any crazy kids sports stories? Feel free to drop us a comment below. 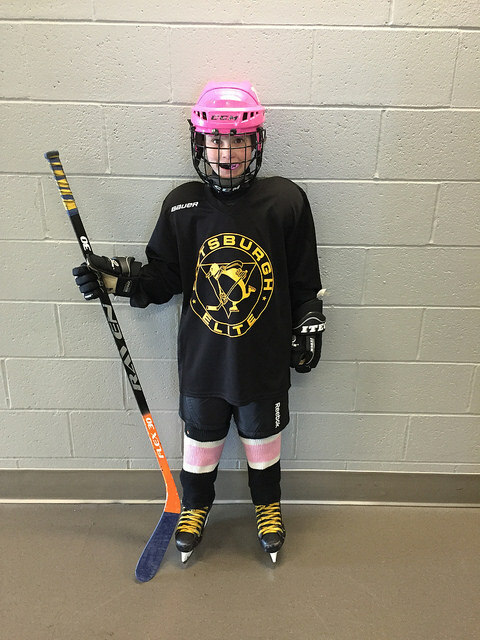 Tagged Girl Hockey, Ice Hockey, Pittsburgh hocky, Play like a girl, Youth ice hockey. Bookmark the permalink.